"We really enjoyed the book, I Believe In Me. It is tremendous. Thank you for your being." Gerald Jampolsky, M.D., Sausalito Center for Attitudinal Healing, author of Love is Letting Go of Fear. "When students arrive at our classes, they can hardly hold their heads up. Your book helps them walk out of here with heads held high." Kathy Dawson, Executive Director, Laubach Literacy Council, Kansas City. "There is a new book that is pretty different, and that's a good thing. It has lots of pictures, and only a few words on each page. But it's not a silly book. The few words on the page are called affirmations. You know how some days you just don't feel very good about yourself. Especially if someone makes you mad or sad. Well, if you use this book and read the words on the page, and look at the pictures, you start to feel better. There is a page that says, 'I'm whole and perfect just the way I am.' Well I don't always feel perfect. But when you read the words and look at the pictures, you do feel ppretty good. One reason is because the picture is a kid looking in a mirror at himself. The mirror is held by his guardian angel. How can you feel bad when your guardian angel is caring about you? Some of the pages I don't always understand. My grandma makes me talk it through with her. Like the page of 'I am Powerful.' It shows a huge animal with horns and a kid on top of the animal. Well how can you feel powerful with a scary animal around and you are just a kid. I felt better after I talked it through. I'm bigger than my brother and sister and I protect them. I pay attention in school most of the time which makes me smarter each day. See it really is a different book - and a good one. There is a different way to read it too. My grandma says to just read one page and then let yourself think about what it means. Then the next day you can read another page. It's probably going to take a year to read it!" Christopher Thornhill, Age 10; a review from the Awareness Magazine, Garden Grove, California. "Through word and art, Connie Bowen offers each reader the gift of feeling God's Presence here and now." Mary Manin Morrissey, Founder and Senior Minister of the Living Enrichment Center, author of Building Your Field of Dreams. "'I Turn to the Light' by Connie Bowen is truly an illumination from on high - the love and truth of God revealed in beautiful words and illustrations. It will open your heart to miracle after miracle." Jan and John Randolph Price, best-selling authors and co-founders of The Quartus Foundation. 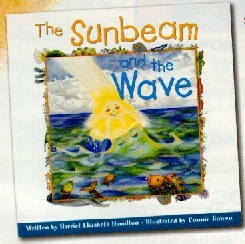 "Author and illustrator Connie Bowen has a unique talent for reaching our children with words of love, healing, and upliftment. It is a rare pleasure to read a book with a pattern and meaning valid for all of us! Such is I turn to the Light, a guide to betterment I sincerely recommend!" Richard Fuller, senior editor, Metaphysical Reviews. "Although written to all ages, including children and teenagers, I Turn to the Light has a definite healing power about it. My own mother was in the hospital in congestive heart failure when this book was mailed to me to consider for review. As I turned each page it spoke to me, and transported me to a level I needed to go. My grief and concern for my mother was overwhelming. The affirmations brought a light to my heart, and hope to my soul. I shared my new-found hope with my mother. I approached her with the concepts within the book. She opened to what I had to say. She made some tough decisions without fear, without hopelessness. For those of you who want to be touched, or give a gift of love to someone who could benefit from some blessed words and inspired illustration, I encourage you to purchase this wonderful book of affirmations, and allow the grace to fall upon you." Julianna Joyce Perkins, a review from the Awareness Magazine, Garden Grove, California. 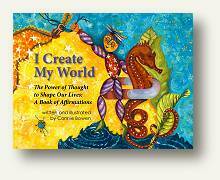 "What Connie so inspiringly offers to children in this book honors and illuminates the core essence of every child's inner greatness. If children were raised with such self-affirmation what a healthy start they would have in life. I purchased this book for all of my grandchildren. And parents, too, will benefit from the wisdom on its pages." Michael Bernard Beckwith, Author of "Life Visioning"
"I Create My World makes creating a life you love an easy adventure. With beautiful illustrations, powerfully moving words and the insight of one who truly knows the truth of how the Law of Attraction works, Connie Bowen has delivered a real gem." Mary Manin Morrissey, author of "No Less Than Greatness"
"Using her innate creative power Connie has created a book of delightful words and images to show us our own possibilities." "This is a wonderful way for children to become engaged with the power of their words to craft their lives. I recommend this book highly." Mimi Doe, Founder of SpiritualParenting.com and author of five books for parents including the best-selling "10 Principles for Spiritual Parenting"
I Create My World is a fanciful collection of 16 full-color illustrations paired with a corresponding affirmation. This whimsical book highlights the importance of our thoughts to shape our lives as demonstrated by the law of attraction. Some of the affirmations included in the book are “I hold the keys that create my world,” “I focus on what I love,” “I am right on track,” and many more. Encouraging children to use their imagination to interpret each illustration is one of the highlights of this book. Each painting contains its own joyful characters comprising a mini-story in itself. Empowering children with self-affirmation at a young age can be a stepping stone to a purposeful life of creativity, lasting fulfillment and joy. 50 Inspiring Children's Books with a Positive Message.